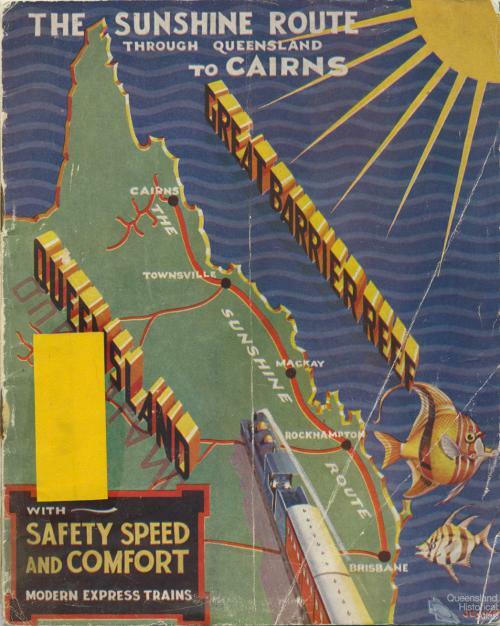 Graphic design ‘The Sunshine Route through Queensland to Cairns’ by Jesson, front cover of The Sunshine Route through Queensland to Cairns, Brisbane, Queensland Railways Commissioner, 1936. The rail line from Brisbane to Cairns was completed in 1924, the journey took over 53 hours. Collection of the Centre for the Government of Queensland.